I just recently finished reading Take Back Your Life: Find Hope And Freedom From Fibromyalgia Symptoms And Pain by Tami Stackelhouse. This is the first book about fibro that I’ve ever read. I was hoping that it would provide answers and a quick fix for my fibro symptoms. If that’s what you’re looking for you won’t find that in this book, but stay with me for a moment. To be fair to Tami there are no quick fixes for fibro. Doctors don’t know all the factors involved in causing fibro and why people experience it differently. So my expectations were unrealistic. These ideas are really challenging, but they also offer hope. I think we all can do better at taking care of ourselves. I know that I certainly need to do a better job of taking care of me. She reminds us that it’s fine to put our needs first, instead of always putting other people’s needs first. This is a new idea for many of us or one we’ve heard many times before, but never believed. Tami’s chapter on sleep encouraged me to really work on getting to bed by 10pm every night. On the nights when I get 9 hours of sleep, I feel much better when I wake up. Without enough sleep I feel so groggy, and struggle all day to stay awake. Her writing about taking care of ourselves, helped me to stop teaching Sunday School when it was just too much for me to handle anymore. When the guilt monster comes my way, I remind myself that I can’t do anything for others if I don’t take care of me first. 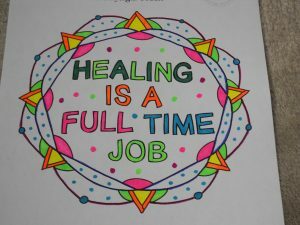 Tami covers how to improve energy levels, lessen pain, and work with healthcare professionals to help ourselves heal. She includes worksheets to really help us implement her ideas. She even includes this fun coloring page on her bonus website. The hardest part of all of this, is realizing that we need to do the work in order to get better. I would definitely encourage you to read this book for yourself and to start to work on changing your attitudes toward your body, your health, and your self-worth. Without attitude changes, healing is probably not going to happen. You can check out this book here. This is not an affiliate link. I purchased and read this e-book for myself. I have also purchased and plan to read Tami’s The Fibromyalgia Coach next. Useful information here Kathryn. My fribro is mild in comparison to others I’ve seen; and mostly a result of chemo side affects. Hope to see more of you! Thanks for visiting my blog. Thanks for reading and commenting! It’s good to have you here.